A good option for manual hair cutting operation, super quiet. The original design, with unique cutting invention design, easily clipping off various hair style. No residue, no hurting skin. Just gently move, perfectly cut hair of human or animal, there is no obstacle. NO noise design when working, enables you to make a haircut while the baby is sleeping. Exclusive patent technology l-shaped cutting, no harm to your skin while well clear the hair. To make the whole cutting process timesaving and effective. 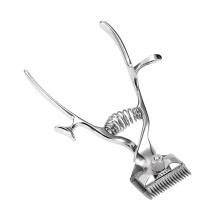 Simple to use, lightweight, you can cut hair for the old people at home.